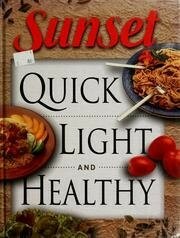 The quickest of Sunset's flavorful low-fat recipes are brought together for the first time in this great collection. These easy-to-make dishes are perfectly suited to the needs of busy cooks today. From appetizers to desserts, here are more than 250 kitchen-tested recipes that can be on your table in 20 to 45 minutes. Fish and Shellfish A.to Z. Fresh Produce A. to Z.